A connoisseur (French traditional (pre-1835) spelling of connaisseur, from Middle-French connoistre, then connaître meaning "to be acquainted with" or "to know somebody/something.") is a person who has a great deal of knowledge about the fine arts, cuisines, or an expert judge in matters of taste. In many areas the term now has an air of pretension, and may be used in a partly ironic sense, but in the art trade connoisseurship remains a crucial skill for the identification and attribution to individual artists of works, where documentary evidence of provenance is lacking. The situation in the wine trade is similar, for example in assessing the potential for ageing in a young wine through wine tasting. "The ability to tell almost instinctively who painted a picture is defined as connoisseurship". Connoisseurs evaluate works of art on the basis of their experience of the style and technique of artists. Judgment informed by intuition is essential, but it must be grounded in a thorough understanding of the work itself. 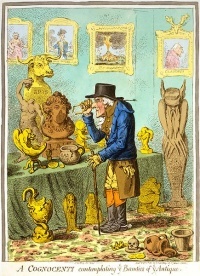 On the basis of empirical evidence, refinement of perception about technique and form, and a disciplined method of analysis, the responsibility of the connoisseur is to attribute authorship, validate authenticity and appraise quality. These findings are crucial for the valuation of works, and can be collected and organized into a catalogue raisonné of the work of a single artist or a school. In his Meaning in the Visual Arts (1955), Erwin Panofsky explains the difference between a connoisseur and an art historian: "The connoisseur might be defined as a laconic art historian, and the art historian as a loquacious connoisseur." During the 18th century, the term was often used as a synonym for a still vaguer man of taste or a pretend critic. In 1760, Oliver Goldsmith said, "Painting is and has been and now will someday become the sole object of fashionable care; the title of connoisseur in that art is at present the safest passport into every fashionable Society; a well timed shrug, an admiring attitude and one or two exotic tones of exclamation are sufficient qualifications for men of low circumstances to curry favour." In 1890, Giovanni Morelli wrote, "art connoisseurs say of art historians that they write about what they do not understand; art historians, on their side, disparage the connoisseurs, and only look upon them as the drudges who collect materials for them, but who personally have not the slightest knowledge of the physiology of art." The attributions of painted pottery were an important project to the History of Ancient Art and Classical Archeology (Ancient Greece and South Italy). Two specialists were the most important authorities in archaeological connoisseurship: John Davidson Beazley (1885-1970) and Arthur Dale Trendall (1909-1995). Connoisseur is also used in the context of gastronomy, i.e. in connection with fine food, beer, wine, tea and many other products whose consumption can be pleasing to the senses. Unless indicated otherwise, the text in this article is either based on Wikipedia article "Connoisseur" or another language Wikipedia page thereof used under the terms of the GNU Free Documentation License; or on original research by Jahsonic and friends. See Art and Popular Culture's copyright notice. This page was last modified 08:54, 11 March 2014.